I almost decided to not review Delfina because, well, it’s Delfina. Everyone already knows how incredible the food is and how hip the neighborhood is and how friendly the staff is. What hasn’t already been said? I’m kind of in love with this place though. It’s one of my favorite restaurants in one of my favorite neighborhoods, and my last dinner here didn’t disappoint. To be on the safe side, I called two weeks ahead of time and made reservations to celebrate a belated birthday. My dining companion and I started with the puntarelle alla Romana, a Roman specialty of puntarelle shoots. Similar to chicory, the salad was tossed with salt-packed anchovy, extra-virgin olive oil, and Parmigiano. This was delicious: crisp, tart and slightly bitter. As soon as I can find puntarelle in the markets, I’m making this at home. Next we had the grilled fresh calamari. Served on a white bean salad and garnished with olives and frisée, the calamari had a great smoky flavor from grilling and was super tender. Squid and white beans are a classic pairing; you can’t really go wrong here. For my entree, I had the rosemary tagliatelle. The tagliatelle was served with guinea hen ragu and vin santo. What’s a guinea hen, you ask? They’re cousins of pheasant, leaner than chicken, and more flavorful. I thought that the vin santo sauce would make the dish too rich, but it was actually a perfect compliment. We were stuffed by this point but we couldn’t resist sharing a plate of dessert at the end of our meal. We decided on the profiteroles. 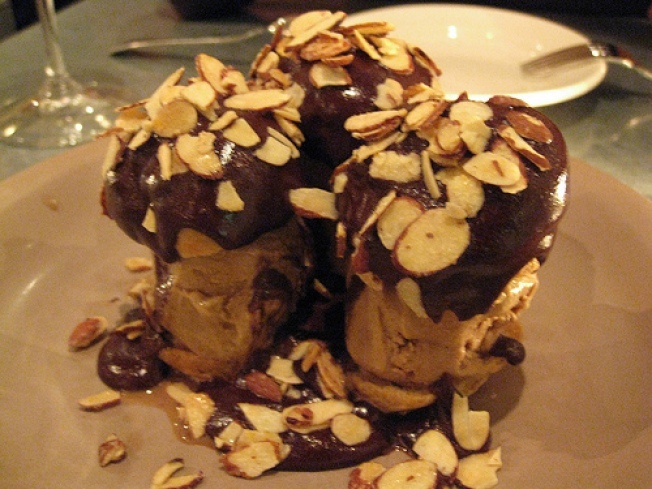 The profiteroles were served with espresso gelato, warm chocolate sauce and candied almonds. The whole thing was really high-quality and extremely decadent. I prefer savory over sweet, but even I was swooning over this dessert. Delfina is a solid restaurant serving excellent cuisine without the attitude that comes with so many fine dining establishments. It’s easily one of the best restaurants in San Francisco. But you knew that already, didn’t you?